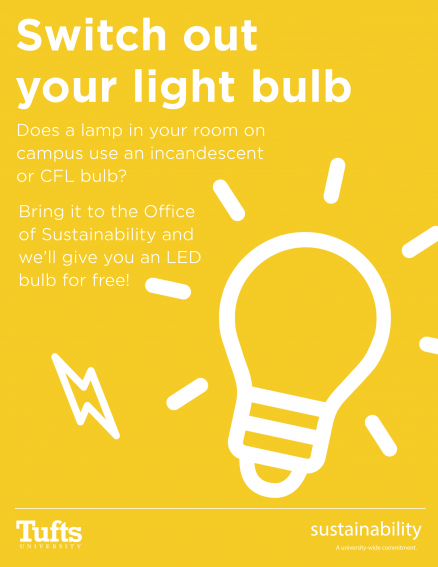 Do you have an incandescent or CFL bulb in one of your lamps in your room on campus? Bring these energy-inefficient bulbs to the Office of Sustainability and we’ll give you a LED bulb for free! The Office of Sustainability is located at 550 Boston Ave. (floor 2) and is open Monday-Friday from 9am-5pm. Replacing energy-hogging incandescents and CFLs with energy-saving LEDs is a simple, effective way to slow the rate of global climate change, increase energy efficiency, and save Tufts’ money.